Commerce and Conservation joined forces when the NamibRand Nature Reserve received a generous donation of cement from Ohorongo Cement. The NamibRand Nature Reserve, an Association not For Gain, is located in southern Namibia. The private nature reserve is focused on protecting and conserving the unique ecology and wildlife of the Namib Desert. The land is made up of 16 former livestock farms which have been rehabilitated into a contiguous, fenceless habitat. Innovative approaches to resource management are required to ensure that this critical area, bordering on the Namib Naukluft Park, is conserved for future generations. NamibRand. Photo: Tok Tokkie Trails. 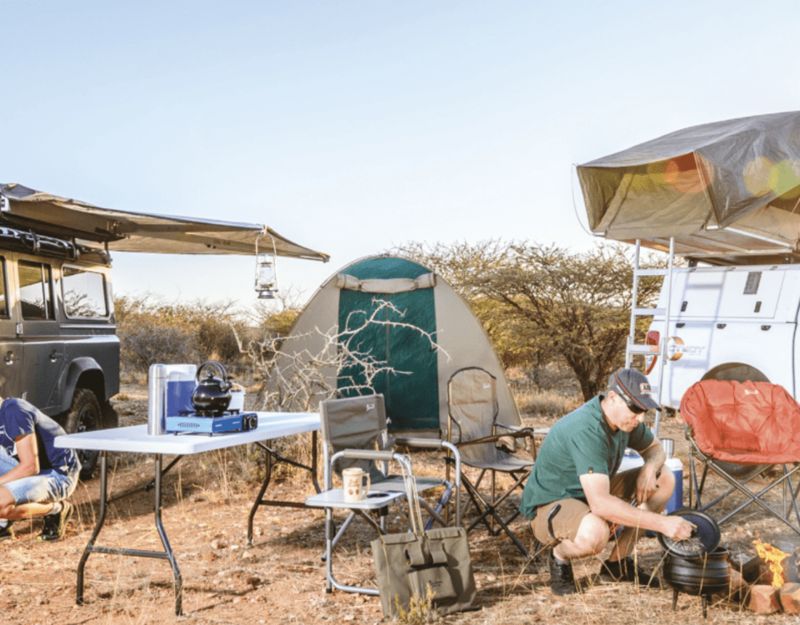 NamibRand Nature Reserve is a model for private conservation in Southern Africa as it focuses on holistic biodiversity conservation, balanced with financial sustainability and low-impact, high quality ecotourism. Conservation efforts are mainly supported through park fees, collected from visitors, which enable the Reserve to be financially self-sustaining. However, special projects require additional funding, which resulted in NamibRand Nature Reserve approaching Ohorongo Cement for support. Several of the Reserve’s waterholes needed to be rebuilt and a motorgate (cattle grid) had to be moved further south so as to remove a section of road corridor fence, which was impeding wildlife movement. Ohorongo Cement kindly donated 200 bags of cement towards the NamibRand Nature Reserve as part of its contribution towards conservation and its dedicated efforts to leave a lasting environmental legacy for future generations to enjoy. 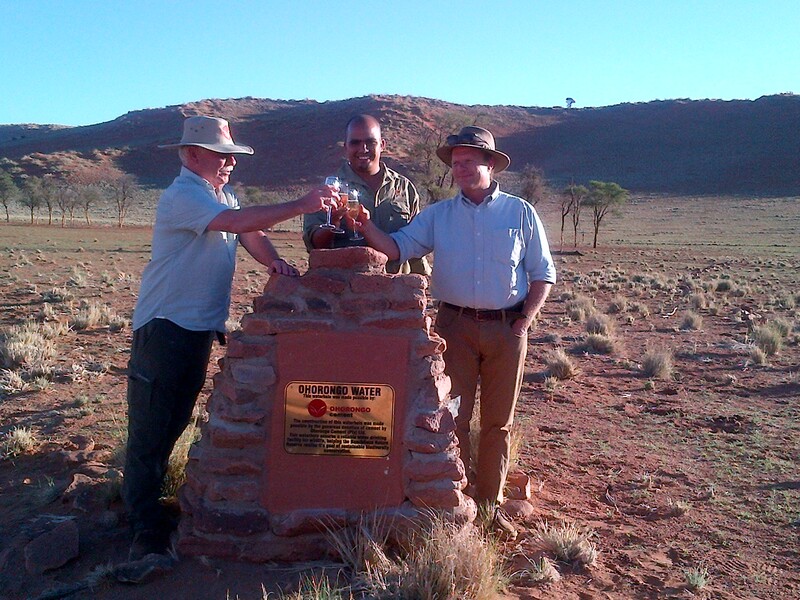 Mr Gerhard Hirth (CEO of Schwenk Zement KG), Quintin Hartung (Acting Control Warden of the NamibRand Nature Reserve) and Stephan Brueckner (MD of Wolwedans/NamibRand Nature Reserve) celebrated the new waterhole on the Reserve, proudly built with Ohorongo Cement. Ohorongo Cement can boast that their CO2 emissions at their Sargberg plant, close to Otavi, is the lowest in Africa and even lower than European Union requirements, making it a flagship to be proud of for the Namibian people. They also make use of alternative fuels to replace coal in the burning process in its kiln. This is done by purchasing woodchips made from the harvesting of intruder bush from its sister company, Energy For Future. The company also utilizes excess heat from kiln again to save time & energy in the burning process of raw material to clinker. Thus it is clear that Ohorongo Cement cares for the environment just as much as NamibRand Nature Reserve does, hence the newly formed partnership towards conservation. An old waterhole that was located close to the Wolwedans base and airstrip needed to be closed down as animals that were drawn to that were increasing becoming a hazard / danger for aircraft landing and taking off. The new site is about 5km away from the airstrip and now ensures that animals no longer present a threat to aircraft making use of the runway. The new site is close to an existing pipeline, which made the commissioning of this waterhole easie. The new waterhole was built in partnership with staff from Wolwedans and the NamibRand Nature Reserve. Permission was recently received from Roads Authority to move a motorgate (cattle grid) to the southern boundary of the Reserve, the newly constructed gate was completed in early 2014. This new gate allows us to remove internal fences which restrict wildlife movement, helping the NamibRand Nature Reserve achieve its dream of a fenceless Namib and realizing their goal of sustainable biodiversity conservation. An official unveiling ceremony was held at the new Ohorongo Waterhole on Saturday, 1 March 2014, which was attended by representatives of Ohorongo Cement, NamibRand Nature Reserve and Wolwedans. “We take care….cement is good for durability and sustainability,” said Mr Gerhard Hirth, CEO of Schwenk Zement KG, Germany, who represented Ohorongo Cement at the event. The success of conservation in the area has proven that a sustainable, biodiversity focused land-use can outweigh the benefits of livestock farming and can contribute significantly more to social, economic and environmental benefits. This brings in more money to the Namibian economy and providing more jobs with less impact on the environment.